When it’s time to settle into a new home or apartment, most people face a tough trade-off: Buying all of the furniture you need calls for a big investment but saves time, while building it yourself takes more hours (and practice) but cuts the total cost. Who better to solve this classic decor dilemma than Jessie Uyeda of HomeMade Modern? 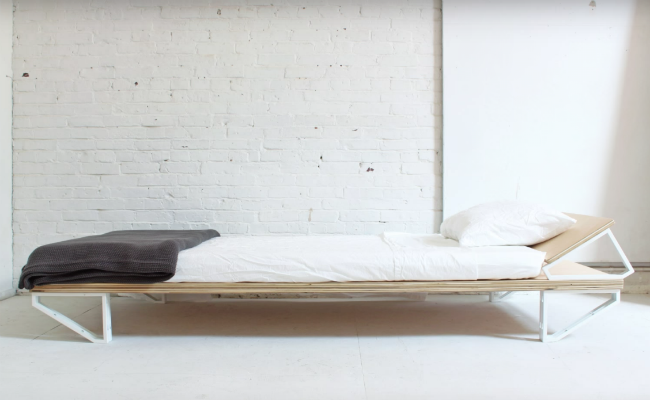 On a mission to furnish her whole home on a budget, the former lumberjack devised a DIY compromise for her video channel‘s master class in minimalism—and discovered how to build a bed frame with a single sheet of plywood and shelf brackets from Ikea. The best part? Even beginners can tackle this project, all for only $75! Uyeda’s bracket bed can be built with the same thrifty trio of tools used to make and hang a set of wall shelves: a cordless drill, a circular saw, and a random-orbit sander. To save some time and effort, Uyeda enlisted free help from her local Home Depot to cut a twin bed-sized portion from one 4-foot by 8-foot plywood sheet to fit in the car. Then, armed with clamps and a circular saw, she cut the excess length into three equal pieces at home—two for the lengthwise support strips, and a third sawed into two more pieces to brace the remaining ends. To keep the bed’s ultra-slim 3/4-inch base from buckling or sagging under the weight, she secured all four strips with wood glue and reinforced the bond with heavy-duty screws. After gluing the supports to the main platform, each corner of the bed’s base is effortlessly elevated by a pair of screw-on shelf supports that feature just enough of a flat bottom edge to act as sturdy feet. Two last brackets shore up the raised headboard to create a stunning and sound bed frame in just four hours. It’s hard to top Uyeda’s sublime sleeper in affordability, ease of construction, or ingenuity. 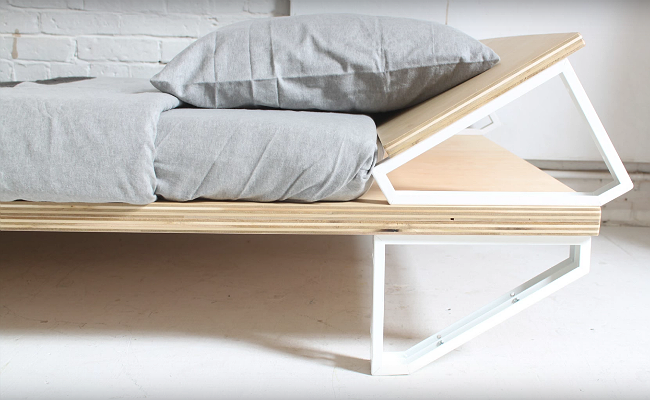 Its flexible design can even be modified to fit any mattress! But topping the DIY platform bed with a mattress, a plush pillow, and lightweight linens will make it bedroom-ready—and you won’t lose any sleep over your budget.